I realized I didn’t do this yet, so here I am now. This was my second LD, and I feel so much more accomplished than I did in my first time around. I made all the assets in the game myself(except for the random gen music), and only used google to figure out what I was doing like half the time. I wasn’t able to finish in time for the competition, but it needed the extra time in the cooker, so it’s all good. Anyway, onto the game. It’s a platformer called The Spooky Ghost. You play as a Spooky ghost. The unconventional weapon is your ability to haunt your enemies and become them by jumping on their heads. The goal is to reach the end of the level (unfortunately I only had time to make one). That’s really my biggest problem with the game – I put in a bunch of mechanics but they’re wasted on just one stage. Oh well, I think I might add some extra meat to the game, maybe. The page is here. Enjoy! It looks like I’ve finished up the vast majority of the programming for all the game mechanics I’d like to implement. Tomorrow will be spent working on art/music/level design. The premise of the game itself is this: you play as a ghost and takeover the bodies of other enemies by haunting them, so your enemies turn into your weapons. Time for my second LD ever. This time I’m gonna team up with a friend of mine. We’re both noobs and it’ll be terrible. Well, I guess I did it, I made a game. It’s kinda fun, but there’s plenty I could’ve done with more time, I feel like. At the end of the day, it was a learning experience for me, and that’s all I ever wanted. Special thanks to all of you guys, for making me jealous and fueling my motivation to keep going. I got a lot done today regardless, The player can now turn towards the mouse and shoot, enemies do damage to you and you do damage to them. Also, I figured out how to display your health and score on-screen. I’m toying with adding different kinds of weapons that you can purchase with points, but we’ll see what I have time for. In the meantime: look at the horde of red squares! Since my last update I’ve added the spawning of enemies (with path finding! ), and made some progress on the map. Tomorrow I’ll be working on letting everybody hit each other,and maybe prettying things up because right now the game looks god-awful. Anyway, Good night everybody, keep doing the amazing stuff you’re doing. I’m not too good at this thing, but I feel like making something, so here I go. I’ll be using Unity and Paint.net, we’ll see what else. I’m working on a top down “Twin-stick stabber”, I don’t think It’ll blow anybody away but I will have made something and that’s enough for me. 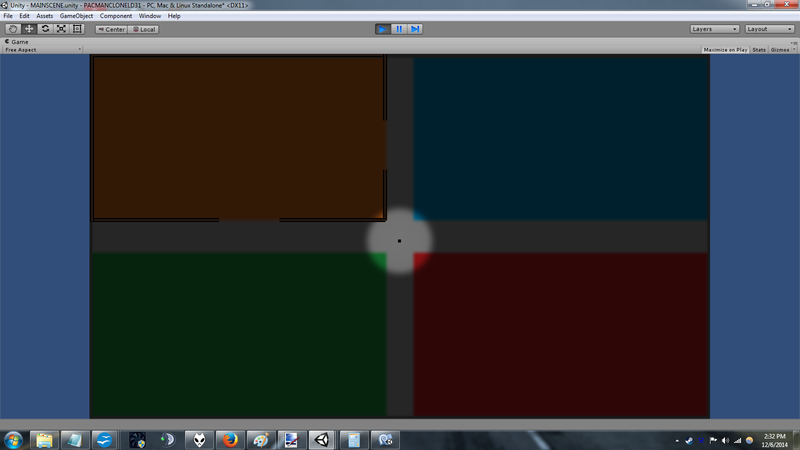 The Idea is that you are the black dot and you have to navigate a maze in each quadrant(Coming soon!). The camera zooms in on each section as you enter, I feel like that keeps with the theme, as it’s still one screen, but now the player can see better. Time to make the maze and add enemies now, I guess. And yeah i know it kinda looks like the Windows logo, sue me.